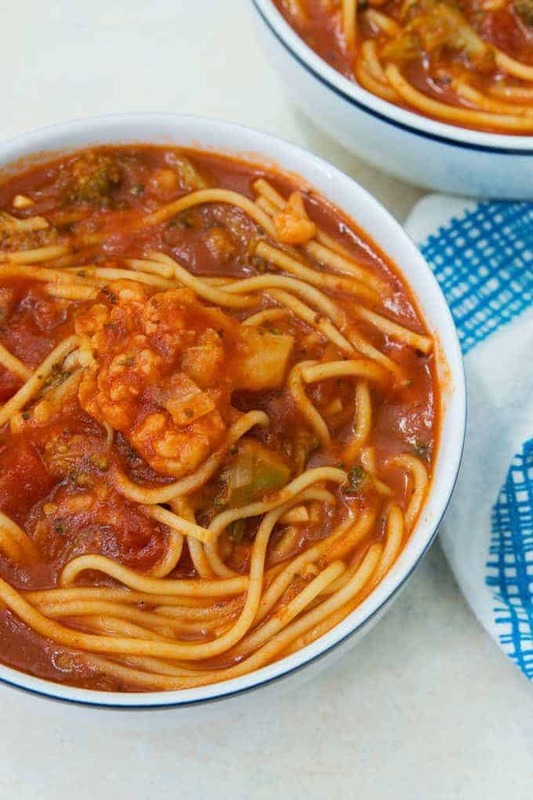 This Instant Pot spaghetti soup is an easy way to get lunch on the table quickly. It has plenty of vegetables and plenty of flavor! I bought an Instant Pot recently and I now understand what all of my friends have been talking about. The hype is real. What a cooking game changer!! Part of what I like is how fast it cooks – it is very aptly named. Making soup is seriously a breeze. As with any new kitchen gadget I had to get used to the settings. Once I did though all I wanted to do was cook “things” in my new pot. I got to thinking… why not make a soup? That’s a pretty good place to start with when cooking in general. Soups are pretty easy to make and are equally hard to screw up. 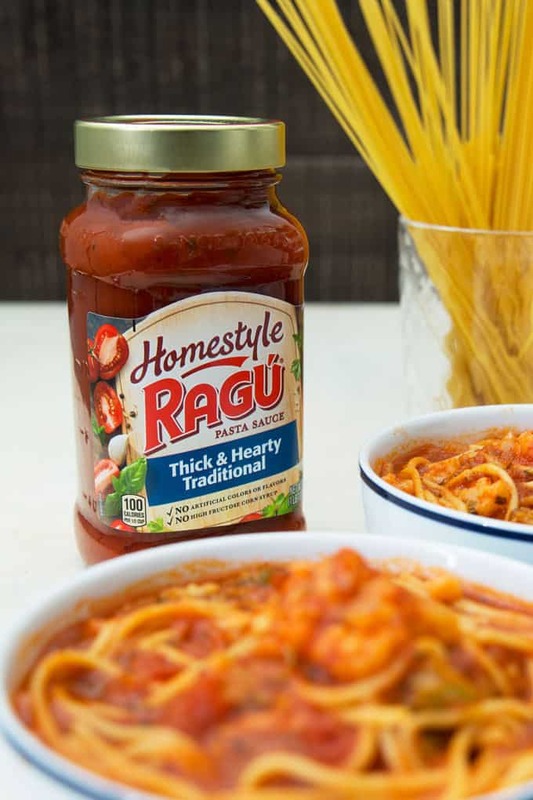 And why not make a soup that includes some of my very favorite things – RAGÚ® Homestyle Thick & Hearty Traditional Sauce and spaghetti noodles. 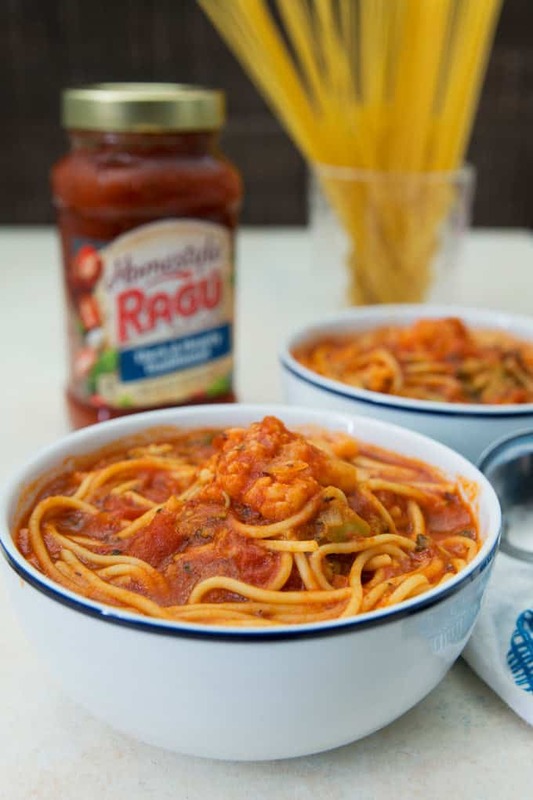 There are so many things you can do with spaghetti sauce and RAGÚ Homestyle Thick & Hearty Traditional Sauce is the perfect base for this spaghetti soup. 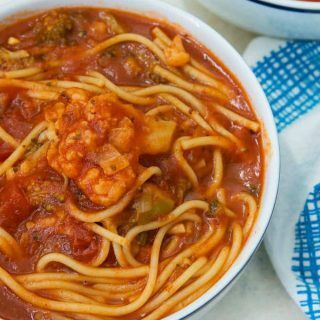 It’s a smooth, flavorful spaghetti sauce – so flavorful that I didn’t need to add any extra seasoning to my soup. It also has no artificial flavors, no artificial colors and no high fructose corn syrup. My secret New’s Year’s Resolution was to eat a healthier diet and this is definitely helping with that. 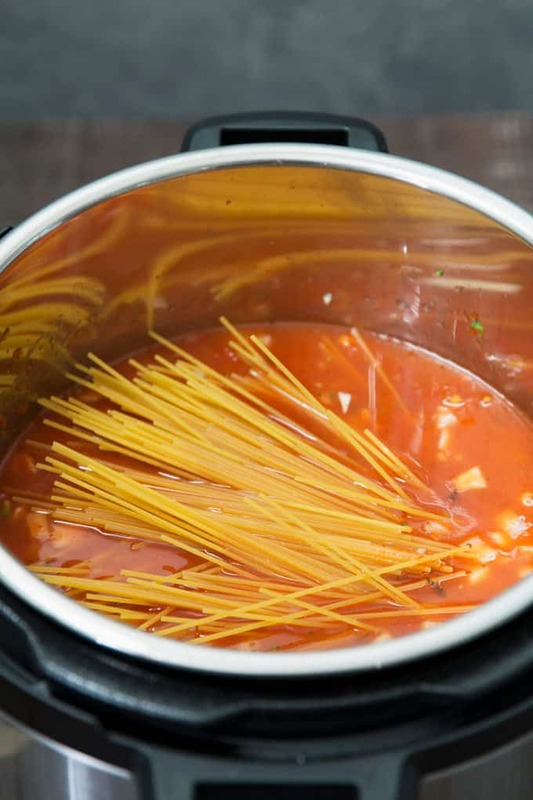 To get started making an Instant Pot spaghetti soup, you want to put your Instant Pot on sauté mode at medium high temperature. Once the pot is hot, add some olive oil and then the diced onion and garlic. The sautéing step is FAST; stir the onion and garlic a couple of times and then add the broccoli and cauliflower. I used frozen veggies because I wanted to cool the pot down just a little bit. No one likes burnt onions or garlic! 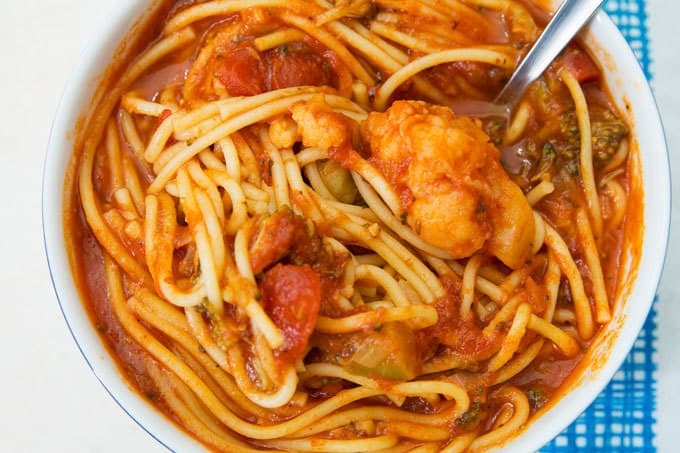 Once the broccoli and cauliflower have softened a little bit (about 3 minutes), add the diced tomatoes and a full jar of RAGÚ Homestyle Thick & Hearty Traditional Sauce. Give everything a good stir. Grab a box of spaghetti noodles and take out about half the box. Break the noodles in half – I tried making this with full noodles and the top half wasn’t cooked. A raw spaghetti noodles is crunchy…. but not edible. Add the noodles to the pot and then top that with the chicken broth. Stir everything again and then seal the top. Adjust the settings to Pressure Cook – High for 2 minutes. It takes a little while to heat up but it does everything it needs to do on its own. Ahhhh, technology. When it’s finally time to release the pressure, you are going to smell spaghetti sauce. And it’s going to smell delicious. You are going to want to grab a bowl and dig in. Well, at least that’s what I wanted to do and exactly what I did. 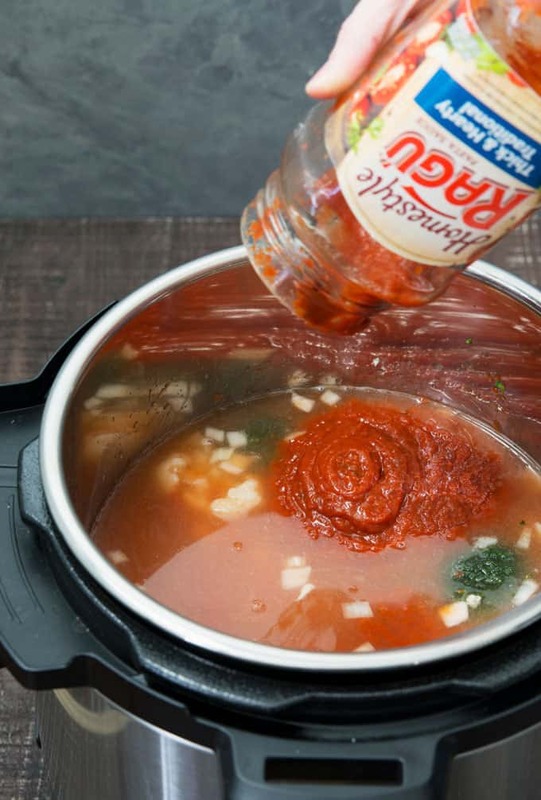 MARCH 29, 2018 (EDIT) INSTANT POT SPAGHETTI SOUPAdvertisement: Your video will begin shortly.Report this adThis Instant Pot spaghetti soup is an easy way to get lunch on the table quickly. It has plenty of vegetables and plenty of flavor! Set your Instant Pot on sauté mode at medium high temperature. Once the pot is hot, add the extra virgin olive oil and then the diced onion and garlic. Sauté for 15-30 seconds, stirring once or twice. Then add the broccoli and cauliflower. 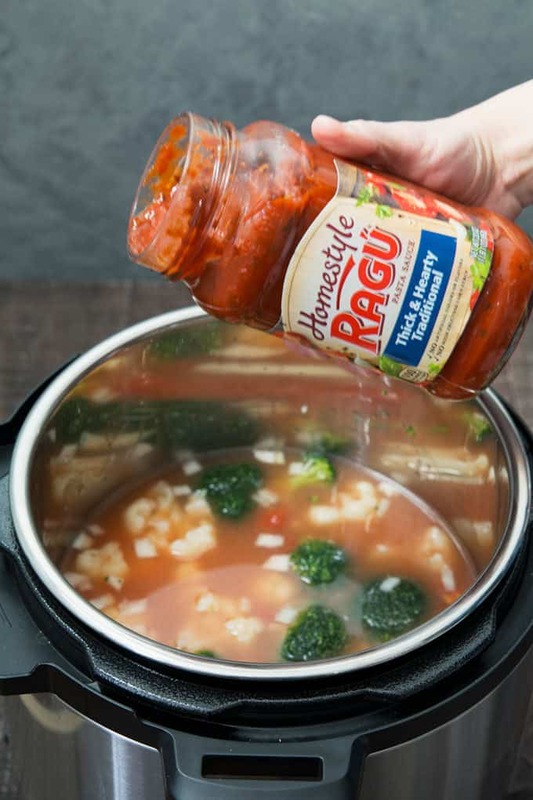 Once the broccoli and cauliflower have softened (about 3 minutes), add the diced tomatoes and a full jar of RAGÚ® Homestyle Thick & Hearty Traditional Sauce. Stir well. Add the spaghetti noodles to the pot and then add the chicken broth. Stir everything again and the seal the top of the Instant Pot. Adjust the Instant Pot to Pressure Cook - High for 2 minutes. When the cooking is complete, quick-release the pressure. Unlock the lid and serve. 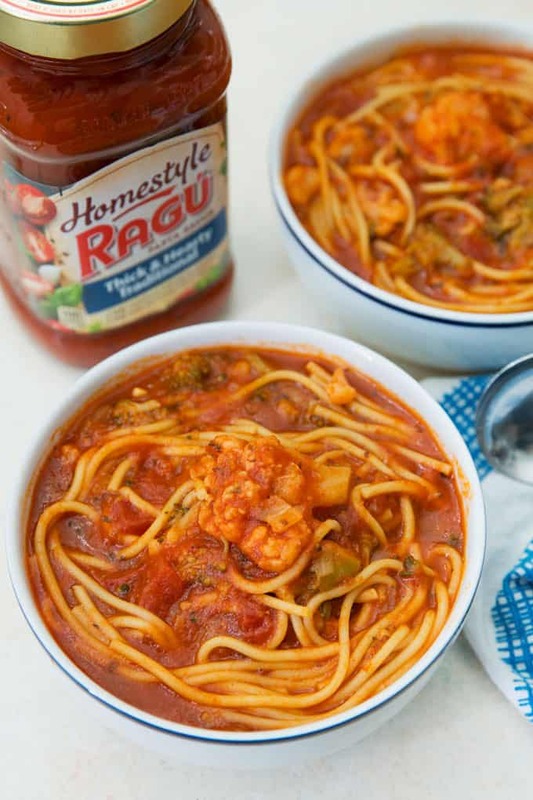 Check out some of my other recipes for Ragu!